During the two years between mid 1933 and mid 1935 Rakusan produced a series of at least 180 individual woodblock-printed fan designs. These fan designs are printed as negative images with a single impression of black ink. Although all are actually woodblock prints, this traditional negative-image printing style is called 石摺(り), ishi-zuri, lit. 'stone rubbing', from its superficial resemblance to that technique. Rakusan called this series 篁子生石摺画選, Koushisei Ishizuri Gasen, lit. 'Koushisei's Stone-rubbing Print Selection', but it is usually called here the Fan Series. Rakusan did not include the Fan Series in his main sequence numbering. Therefore, the original number used for each of the 36 Series prints has been modified to identify the Fan Series members of its theme. The five different fan silhouette shapes have been here assigned arbitrary numbers 1 through 5. To indicate a fan design these shape designations are added to the 36 Series number separated by a hyphen. In themes which contain duplicated fan shapes, one has been arbitrarily designated A and the other B. 121-2A indicates that this is one of two Fan Series designs with fan shape 2 in the 121 Kumazasa Bamboo-grass and Pine theme. Like all other designs in this series, 121-2A was only produced in a single print run, and few copies are currently documented. The 121 Kumazasa Bamboo-grass and Pine theme has a complex history, and it has more individual prints than any other theme. Rakusan had originally planned to have two separate themes, one for kumazasa bamboo-grass and one for pine. 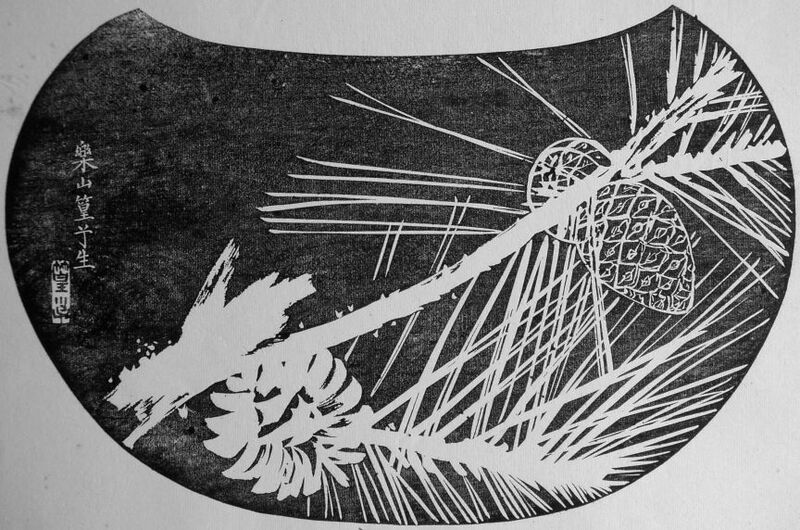 From the signature and seal markings, it appears that two of the pine fan designs may have been created as early as the end of 1933, and the other two pine designs (including 121-2A) and all four kumazasa bamboo-grass designs by early 1934. Then Rakusan set both incomplete groups aside for several months. Around the middle of 1934 Rakusan changed his original plan and combined the two as a single compound theme. He then painted 121-0 as the model for the 36 Series design 121 which included both original components. The Fan Series delivery documents for installment six in September 1934 announced that kumazasa bamboo-grass and pinecone designs would be published the following month. Those for installment seven confirm that the Fan Series of the121 Kumazasa Bamboo-grass and Pine theme were printed during October 1934 and distributed October 15, 1934 as part of installment seven (of twelve). 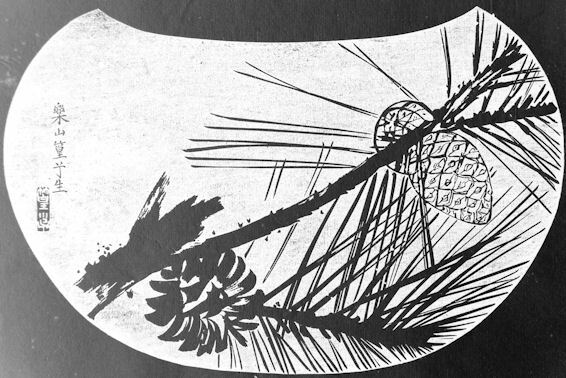 On both sets of delivery documents Rakusan used the theme subject title 熊笹に松笠, kumazasa ni matsukasa, 'kumazasa bamboo-grass and pinecones' which is only an appropriate title for 36 Series design 121 published at the same time. Because Fan Series design 121-5A contains only pine seedlings and pine needles without pinecones, here a more general theme title 隈笹に松, kumazasa ni matsu, 'kumazasa bamboo-grass and pine', has been adapted. The original spelling of Rakusan's title is used here only for the 36 Series design 121 for which it was devised. This compound theme incorporates eight designs, three more than the normal quintet. There are two designs each for fan shapes 1, 2, 4, and 5, but none for fan shape 3. Using all eight designs from this theme meant that for installment seven to have exactly fifteen designs, the other themes in this installment would have to have fewer designs than normal. Accordingly, none of those three themes,119, 120, and 121, ended up with a regular fan quintet. The general name for all kinds of pine trees, Pine, Pinus, spp. is 松, まつ, マツ, matsu. It is difficult to identify the exact species of pine that Rakusan intended to show. The pines illustrated in this theme most closely resemble the pine in 39. However, in the title-caption for 39 Rakusan uses the general name 松 matsu with the descriptor 小, ko, 'small, young' which here refers to the age and/or size of the pine and is not a species designation. In the future it might be possible to identify the pine species more closely.